The grant was part of Clorox’s What Comes Next Project, where the cleaning products company sought out people in communities all across the country who were looking to create change for the better in their community. A band called Bad Shapes performs in the Pharmacy’s new rehearsal space the day it’s unveiled. 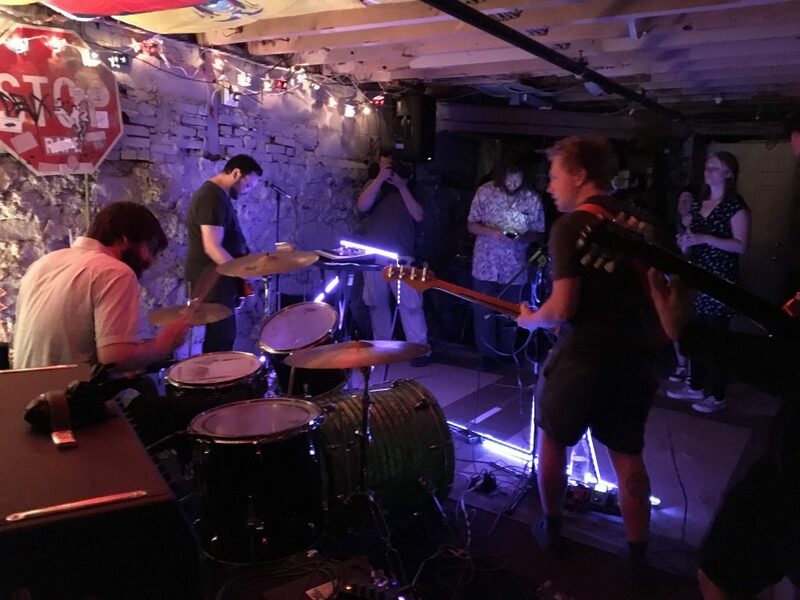 Thanks to a $10,000 grant from Clorox, bands and recording artists from all over South Philly will have cheap access to a new recording studio located in the basement of The Pharmacy, a Point Breeze-based coffeehouse and live music venue. Rates for the studio, which doubles as a rehearsal space, will go for $25 an hour or $250 a day, which is a bargain for most artists, especially if the fees can be split amongst multiple band members. The grant was part of Clorox’s What Comes Next Project, where the cleaning products company sought out people in communities all across the country who were looking to create change for the better in their community. The project is being done in partnership with Upworthy, a media outlet geared toward sharing positive news from around the world. Thousands of people were nominated, and luckily for Viteri, an intern for Upworthy was familiar with The Pharmacy and nominated him. He ended up beating thousands of other submissions. 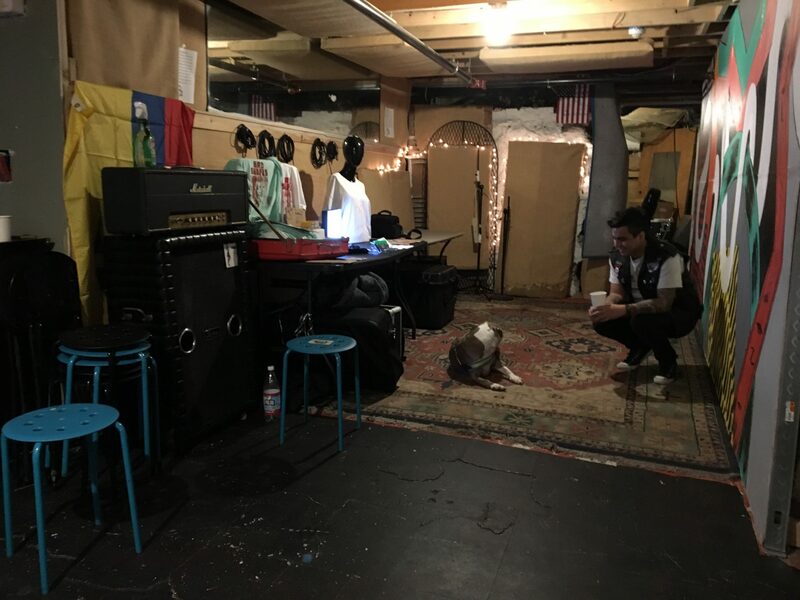 “The Clorox grant just came at a cosmic time,” said Viteri, who noted that he had long dreamed of putting in a recording studio in the venue’s basement. Viteri used the money to revamp the basement into a studio, complete with high-quality music gear and a control room complete with a mixing board. Eventually, Viteri is looking to open a bandcamp page or a YouTube channel to help promote the bands that play and record at his 18th and Wharton location, which used to be an actual pharmacy and clinic in the ‘80s. Gary Viteri and his pit bull Sharkie chill in the new studio in the basement of The Pharmacy. Interestingly, when Viteri was in his mid-20s, he played in a punk band called Dirty Tactics, which opened up for a few high-profile bands such as the Dead Kennedys, The Bouncing Souls and the Dropkick Murphys. But that came to a sudden halt in 2009, when he was working his side job as a bike messenger around Philly. He was hit by a UPenn truck, which badly injured his leg, and resulted in a giant hole in his ankle (he eventually made a full recovery). He sued, won a $60,000 settlement and after paying his attorney, he used the remaining funds – about $30,000 – to put a down payment on the Pharmacy, which he purchased for $112,000 with the help of a mortgage cosigned by his parents. At the time, Point Breeze wasn’t the attractive neighborhood it is now, so Viteri made out pretty well with his investment. “At the time, the American Sardine Bar was the only thing in the neighborhood,” he said. Since that time, Viteri is proud of not only what his business has become, but what the bands his business has supported have become.